The start time of each lesson depends on the weather and sea conditions, which the instructors evaluate as close to the day of your lesson as possible. You can let us know which time you'd like to begin, but the start time will be determined by nature. The actual surfing time is 2 hours. Transfer takes one hour (30 min one-way), briefing is 30 minutes, and stretching/video analysis is 30 minutes. For the first day of lessons (or if you only book one day), the surfing time is 1.5 hours. If you would like to book more than 7 courses, the price increases by 40 euros for each extra day. To make a booking for over 7 days, please contact us. Our instructors have a license recognized by the FCS (Canarian Surfing Federation) and the ISA (International Surfing Association). They follow scientific methods of teaching and analysis approved by the major federations of the world. If you book at least 3 days of courses, you will receive 1 video analysis. If you book 5 or more, there are 2 or more video analyses. The analysis can be done before, during, or after the lessons (depending on many factors). BBQ lunch is served on a beautiful beach of Fuerte's north coast. There must be a minimum of 4 people. Once you make friends with fellow students, it is usually easy to organize a group to go with. The menu is meat or fish cooked on the BBQ, with vegetables, fruits, and drinks. The price includes transfer to/from the location. If you book a week of courses and add only photos or only video, the price is 50 euros for the full week. If you book a week of courses and add both photos and video, the price is 90 euros for the full week. Requirements for this course are: Minimum age of 6, good general health condition, and the ability to swim. These courses are available year-round. The course must have a minimum of 4 people to run. If you book for fewer people and not enough people join, we will give you the option of rescheduling or a full refund. With more white sandy beaches than all the other Canary Islands, Fuerteventura is a surfer's paradise. Known as the “Hawaii of Europe” thanks to its similar climate and too many surf spots to count, this unique location never disappoints with its sunshine and welcoming waves. 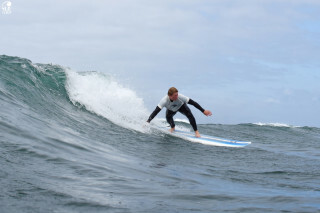 Our intermediate surfing lesson covers everything you need to get better, faster, stronger (and cooler). You learn to independently analyze the sea forecasts, consider sea conditions when choosing the best place to surf, and a whole lot of techniques and maneuvers that'll feel natural by the end of the course. So whether you choose to join us for one day, two, or a whole week, you will end the course much closer to an advanced level than before. Our licensed instructors make sure of that. Following your hotel pickup is a 30-minute drive to the surf academy, where we begin with a safety briefing. Our licensed, highly experienced instructors tell us the plan of the day and provide all equipment and instructions. Thanks to the small group size and skilled instructors, you'll get tips and tricks that fit your abilities and challenge you just the right amount. We warm up with a few minutes of functional exercises and practical lessons on the beach. Under the supervision of our instructor, we enter the water, waves splashing as we test out what we’ve learned. The light, soft sand and gorgeous palm trees are the perfect view from the crystal clear sea, and the sunshine warms you as you practice surfing on both your frontside and backside. Midway through our two hours of surfing, we take a 15-minute break to rest. Your instructor gives you a few tips on how and what to improve, and then it’s back to the water. Before we drop you off back at your hotel (or before our BBQ lunch, if you add this extra service), we cool down with some light stretching. If you book at least three days of courses, there will be a video analysis of your sessions, the perfect way to understand your instructor's feedback. There's nothing like surfing, and there's nothing like Fuerteventura's beaches. The combination of the two is an experience that leaves you wanting more. Luckily, your new surfing skills are a great reason to come back for another visit.